Google is finally addressing one of the biggest issues with Android and the OEMs associated with it. Yes, we are talking about the messy update cycle, which has got most of the Android users complaining. Now, before the I/O 2017, Google has announced “Project Treble” that will be responsible for helping OEMs to deliver updates on time. Android O is the foundation for the change, and it is being made in a manner to make the update cycle faster and affordable for the manufacturers. The inspiration behind Project Treble is Compatibility Test Suite (CTS) that will enable developers to write apps that would be compatible with the billion of Android devices. It will eliminate the need to make changes for every version of the OS and the type of device. Google is looking at a modular architecture, which will divide vendor implementation or device-specific lower-level software written by silicon manufacturers from the Android OS Framework. Silicon manufacturers refer to the companies that produce the chips powering Android devices. These companies modify the new release of software according to their specific hardware. 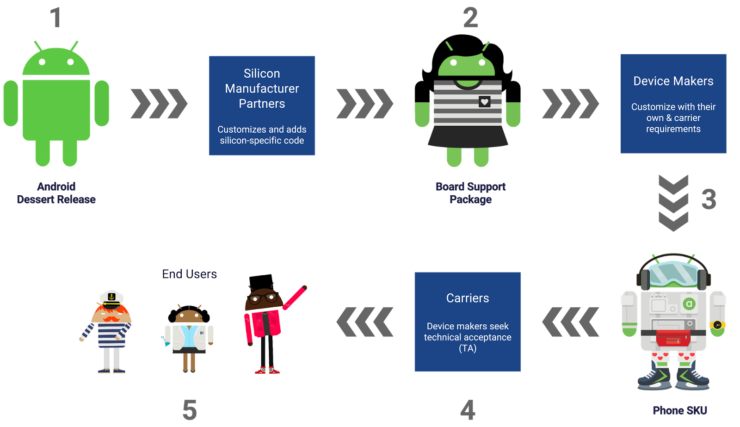 With Project Treble would be eliminating the unwanted factors by introducing a new vendor interface that will act as a bridge for Android OS framework and the vendor implementation. This new interface is based on Vendor Test Suite (VTS), which is similar to the Compatibility Test Suite (CST). VTS would ensure that better compatibility for the vendor implementation. Earlier, most of the Android code would need to be in alignment with the latest version of the OS. But with Project Treble, manufacturers would be free to avoid chip vendors like Qualcomm. This way, manufacturers would just need to update the Android OS framework to release the new update without the need of codes by silicon manufacturers. It eliminates one step from the drill that would help the OEMs to deliver timely updates. Project Treble’s updates do not seem to cater to older devices. Google says that it would be active for the “devices launched with Android O and beyond.” But the Pixel devices that are currently on the Android O Developer Preview are running Project Treble architecture. For now, we just have limited information. Google would publish the full documentation for Project Treble with the launch of Android O.